Sejal Desai - Shark In Heels, Inc.
Sejal Desai is the Program Director for Entrepreneurs For North Texas (EFNT), a Program of the Communities Foundation of Texas that makes it easy for small and mid-sized companies to develop philanthropic strategies and enhance community engagement. Throughout her career, Sejal has worked with over 300 entrepreneurs and 35 venture-backed companies and investors. Currently, she is the founder of SevaYatra, a social venture that offers short-term service project opportunities at NGOs in India. Sejal is a co-founder of the Orchid Giving Circle and serves as the Grant Committee Chair, as well. She currently serves on the Leadership Advisory Councils for the American India Foundation’s DFW Chapter, the Board of the DFW South Asian Film Festival, Opportunity Plus, the Philanthropy Council of North Texas Food Bank, and is a graduate of Leadership Richardson. 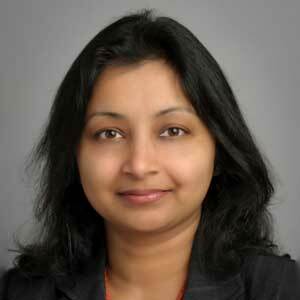 She also has extensive working knowledge of the philanthropic community in India and US. She began her career at D.J. Shukla & Co., where she handled personal taxes and conducted audits for domestic corporations. Previous Manager in the corporate advisory services division for Ernst & Young in Mumbai, India for a few years where she worked on various foreign inward investment projects, valuation as well as due diligence studies. Previous Principal at MHT Partners, a boutique investment bank based in Dallas where she worked on cross-border merger and acquisitions primarily between US and Indian companies. Previous Co-Founder and Principal of STARTech Early Ventures, a seed stage venture firm, that invested in early stage technology ventures in Texas. Led various entrepreneurial education and training efforts as CEO of STARTech Foundation, a sister organization of STARTech Early Ventures. Co-founded and sold a hands-on science education business, Mad Science of Denton County. Served on the boards of The Dallas Assembly, thinkIndia Foundation, Texans Credit Union and On-Target Supplies & Logistics Ltd.
Sejal holds a Masters in Liberal Studies from Southern Methodist University. She has an MBA from the University of Texas at Dallas and she is a Chartered Accountant from the Institute of Chartered Accountants of India. Sejal lives in Dallas with her husband, Hemang and two children, Mohan and Maya.